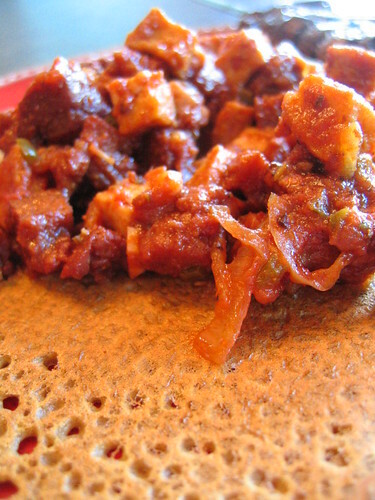 We picked up Marcus Samuelsson's "Soul Of A New Cuisine" from the library this week, and decided to give the injera and stew a spin. 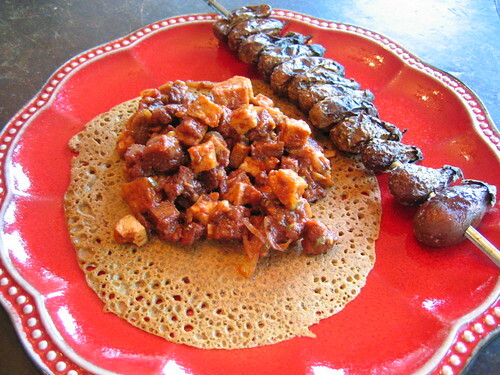 The injera is different than the traditional method where the teff mixture ferments (much like dosas) for a few days before being cooked on the griddle. His method uses teff, white flour, soy yogurt, baking soda, club soda, salt and is cooked much like crepes -- we used our trusty flat-bottomed carbon steel wok that works surprisingly well these situations. 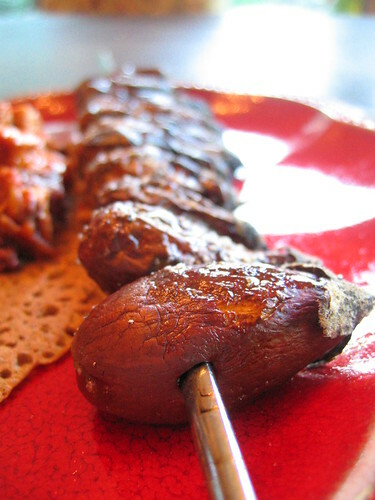 We grilled the last of the mini-grafitti eggplants, which again were very creamy, very tasty one-bite morsels that paired well with the injera/stew combo. 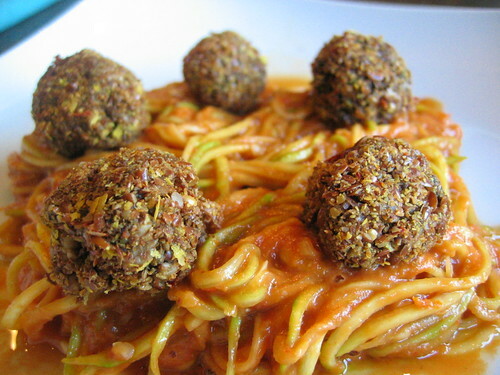 Zucchini pasta with marinara sauce (tomato, sun-dried tomato, red bell pepper, dates, basil, olive oil, lemon juice, salt, pepper), with "meatballs" (portobello mushrooms, almonds, sunflower seeds, red bell pepper, cherry bomb pepper, celery, olive oil, nama shoyu, pepper, oregano, parsley, rosemary) formed into balls and then rolled in a ground flax seed coating and dehydrated for 8 hours at 115F. I could eat this at least once every day and have no complaints. We grabbed a giant handful of the dwindling basil supply from off the deck, added olive oil, lemon juice, garlic, pine nuts, pepper, salt and nutritional yeast to the vita-mix and processed. 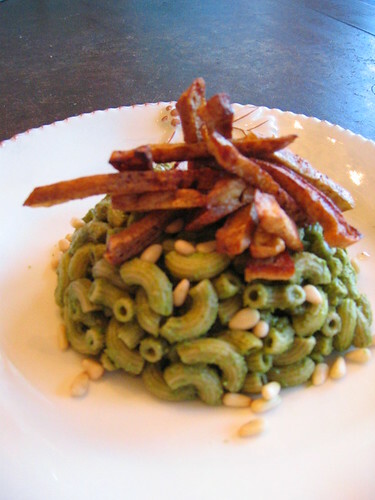 The pesto was added to the hot pasta and tossed to combine. The twice-fried tofu was shredded and added on top. 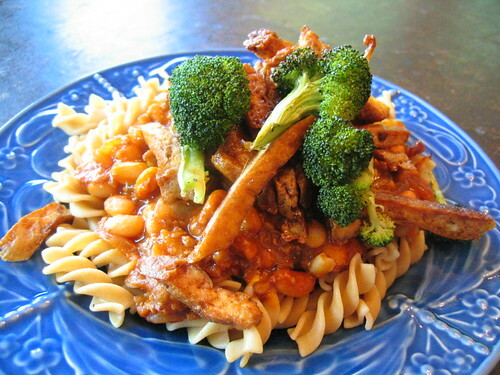 Garnished with toasted pine nuts. The weather was downright cool for August, so we used up the rest of the tomatoes in our version of osso buco -- a mirepoix base (carrot, onion, celery) along with hickory smoked seitan, roasted delicata squash, tomatoes, red wine, thyme and veg stock. 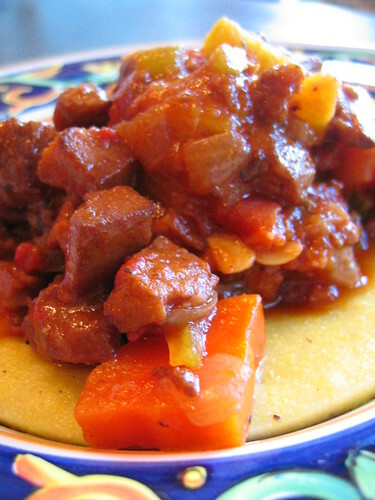 Served over creamy polenta. There's a long section in Bill Buford's book "Heat" which describes making polenta outdoors for 200 people in Nashville. He learns not too worry about the cooking time, constant stirring or the consistency issues after adding water -- his revelation is that none of that matters -- long and slow cooking with the occasional stir will do just fine. And he's absolutely right. Homemade tomato sauce, nutritional yeast, mushrooms, garlic, alder smoked potatoes (30 minutes) and tofu (cut into strips and stir-fried). Liz made the dough in the morning, parked it in the fridge, and let it rise slowly. Today was the death march back to school shopping trip for clothes, school supplies and to top it off a trip to the school to see the class assignments for the upcoming year. By the end of the trip, we were all exhausted, but we now have enough pencils, paper and index cards to supply three families... 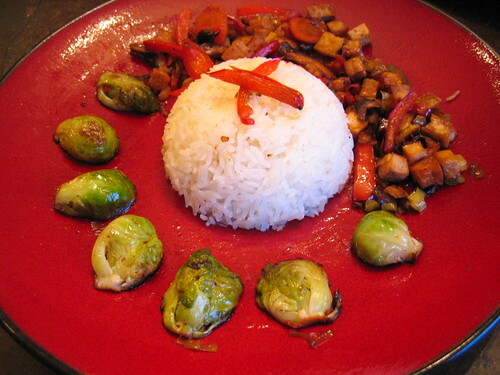 So stir-fry is your friend on nights like these. 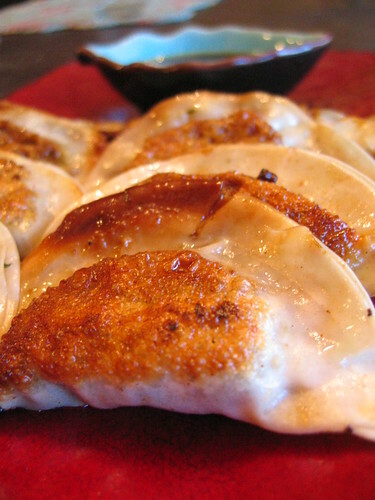 We haven't made gyoza in quite a while, and it was really nice to have these along with the stir-fry. Liz had made the filling before we left on the shopping trip, so it was really easy to just defrost the wrappers, stuff, seal and fry. 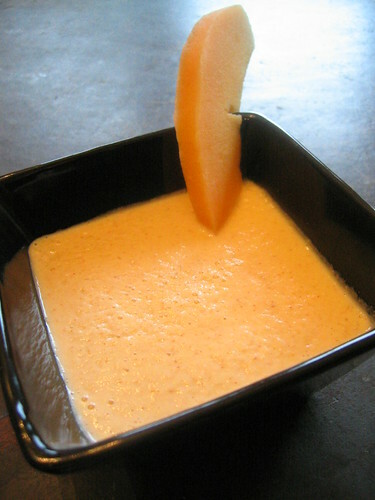 In a blender, puree all the wet ingredients together and add to a small sauce pan, bring to a bare simmer, then turn down to low for 30 minutes, whisking occasionally. The sauce should be thick but smooth. If the sauce separates, whisk together before serving. Check for seasoning right at the very end. If you add salt at the beginning, by the time it reduces, it'll end up being way too salty -- better to add it near the end. 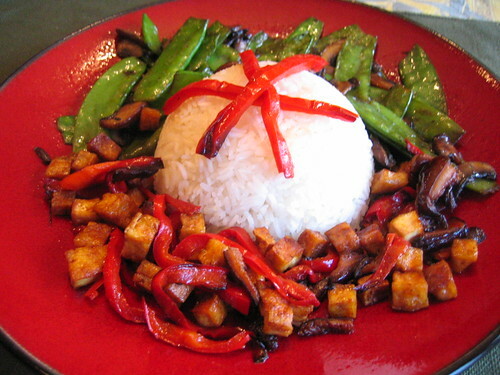 Marinate the tofu with tamari and black pepper for about 30 minutes. Drain and coat the tofu with the seasoned flour. Pan fry with canola oil over med-high heat until golden brown and crisp. Remove from pan and put on a sheet tray in a warm oven. In the same pan as you used for the tofu, toast the sesame seeds in the soy margarine until they give off an aroma. Then, add the spinach and wilt until it gives off most its liquid. Add the seasonings and the veg stock. Continue to cook until almost all the liquid evaporates. Check for seasoning. Keep warm. In a large bowl, mix the dry ingredients, slowly add cold water and whisk until it becomes like a pancake batter. Add the corn. 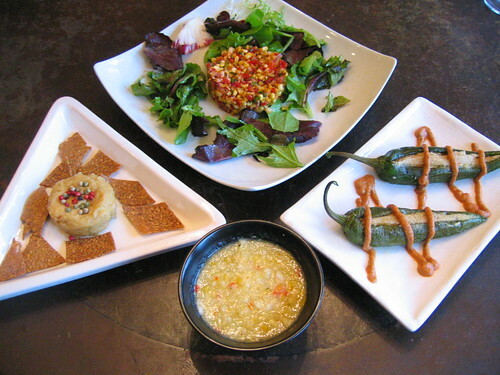 To assemble: Lay one corn cake down in the center of each plate, and add the wilted spinach on top. Add the cream sauce around the corn cakes. 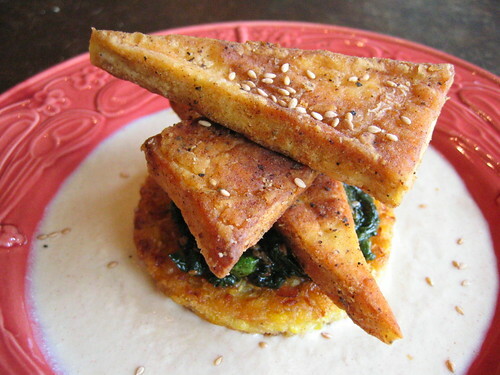 Stack the fried tofu on top of the spinach and garnish with additional toasted sesame seeds. The burgers were from "Living Cuisine" by Renee Loux Underkoffler and were portobello mushrooms, walnuts, celery, parsley, basil, zucchini, nama shoyu, olive oil and black pepper topped with red onion, tomato, lettuce. 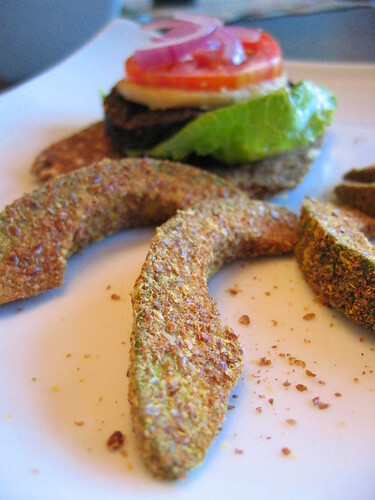 The bread was from Ani Phyo's excellent new book "Ani's Raw Food Kitchen." After a discussion on Flickr with catofstripes about the tofu triangles last time around, we took them as step further and added some sake to the gin (along with some tamari, black pepper and cornstarch) for Saketini Tofu Triangles! In a large bowl, add the tofu triangles along with the gin, sake, tamari, pepper and let marinate for at least 30 minutes (longer is better). Add the cornstarch and gently coat the tofu in the mixture. Deep fry in 375F oil for a total of 5-6 minutes, flipping at least once. Drain the tofu and let cool slightly. 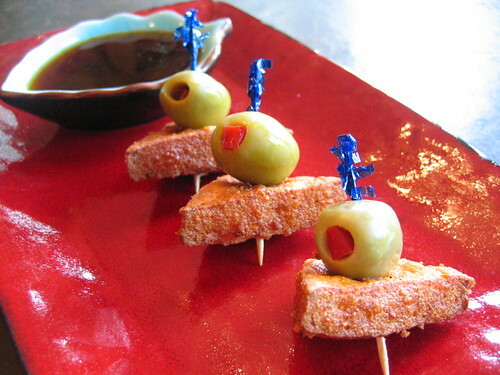 Secure an olive (or pickled onion) with a toothpick and serve with a dipping sauce of your choice. When my sister came up to visit last week, she brought a large bag full of Anaheim chiles along. 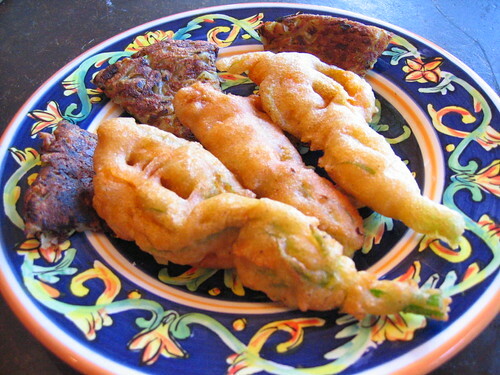 So, we've been trying to use them wherever we can -- like tonight's Chiles Rellenos. They're slit down the side, seeded, stuffed with spiced cashew cheese (garlic, mexican oregano, white miso, black pepper, salt, shallot) and dehydrated for 6 hours at 105F. 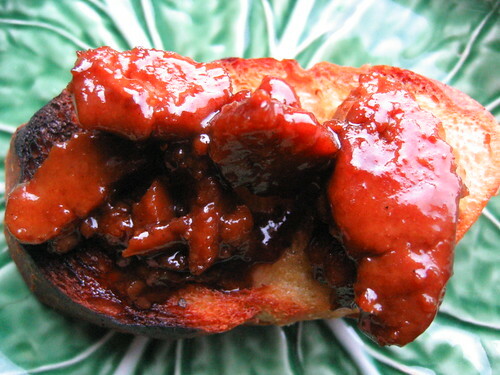 Served along with our pumpkin seed mole sauce. 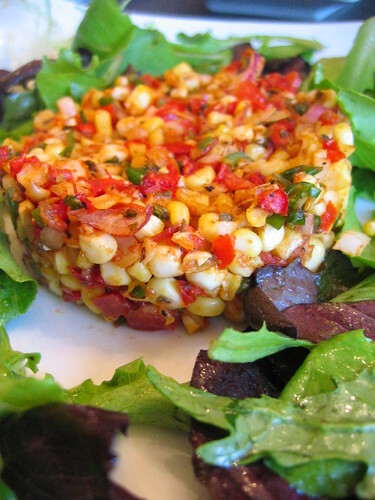 The corn salsa is a variation on the spicy corn recipe that we made a couple of weeks ago. This uses corn, lime juice, fresh ground cumin seeds, mexican oregano, chery bomb peppers, garlic, onion, tomato (seeded), nama shoyu, olive oil. Tossed together and put on a teflex sheet about an hour or so before dinner. Served with lime vinaigrette dressing and mixed greens. 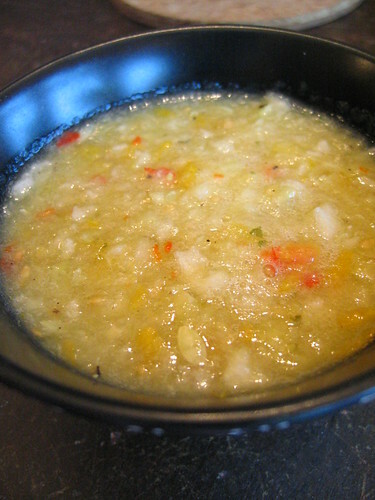 The yellow gazpacho used yellow tomatoes, lemon cucumbers, lemon juice, garlic, cherry bomb pepper, salt, pepper. You can add a pinch of apple cider vinegar if the low-acid yellow tomatoes need a little extra help. It turned out very nice and mellow -- and as a bonus, used all local and organic produce. 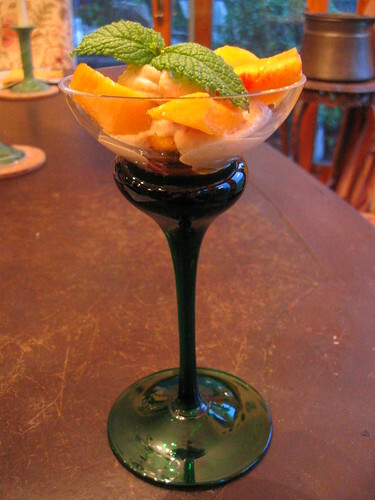 Served along with a cashew, date, orange juice and agave "cream" sauce. 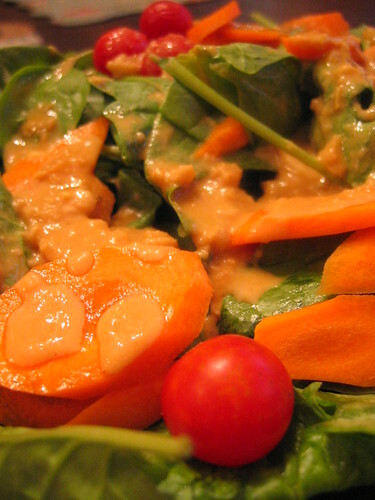 The raw salad for dinner idea came along about 8pm last night. 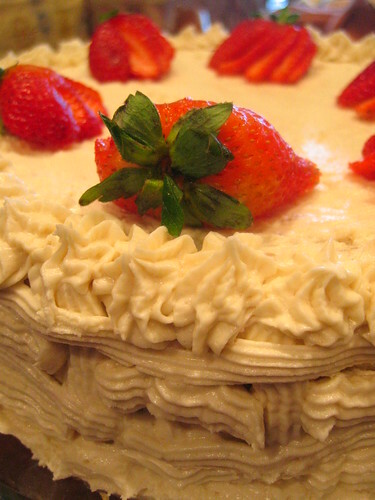 The salad was a result, due in no small part, to the birthday cake that was consumed in the late afternoon. Lots and lots of cake. So much cake in fact, that there was nap involved afterwards. That was followed by a brisk three mile walk which did nothing to lessen the need for stretchy pants. 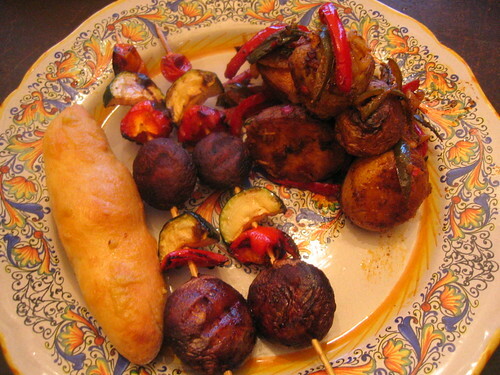 Another mini-tapas night -- soup and breadsticks (same recipe as last night, just made slightly thicker and shorter), patatas bravas (crazy spicy!) 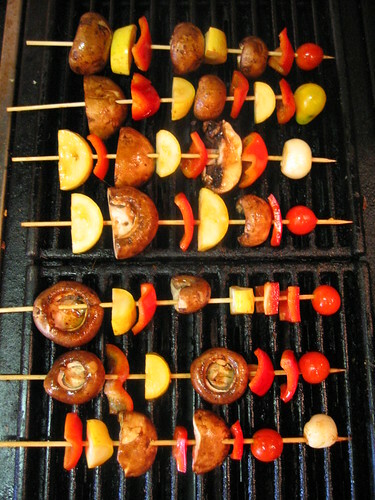 and the house favorite of marinated veggies on a stick (a.k.a. 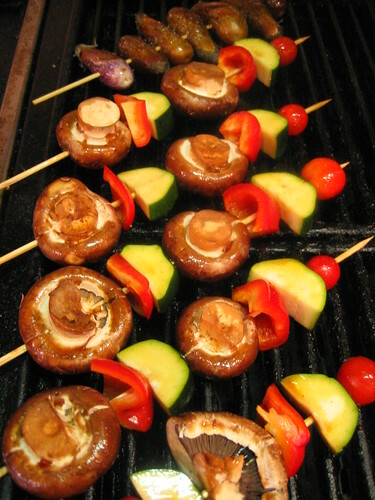 kebabs). ... the were incredibly creamy, one-bite morsels. We picked them up at our local grocery store -- probably a one-time seasonal opportunity. Trying out a couple of new dishes tonight -- the burgers (a.k.a. 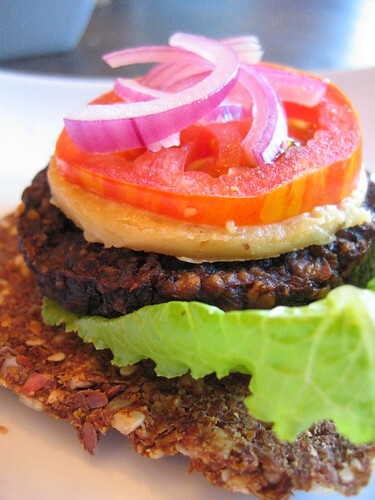 "Lower East Side Burgers") are adapted from Renee Loux Underkoffler's "Living Cuisine." It's a mix of pumpkin and sunflower seeds with broccoli, fennel seed, oregano, olive oil, sea salt and pepper ground in the Vita-Mix and dehydrated for six hours at 105F. The issue we have with most burger recipes is that the patties are way too big to start with -- usually around 1/2 to 1 cup of filling per burger -- which is why they take forever to dehydrate, up to 20+ hours in some cases. That's why we use the ring mold and go with a 1/4 to 1/3 cup per patty. It cuts down on the dehydrating time and you don't get that feeling like you'll never be able to finish. Plus the texture is more consistent from the first bite to the last and from burger to burger. Drain the almonds and add to a high speed blender or vita-mix, along with 1 1/2 cups of water and process to a creamy consistency. Strain the mixture through a medium sieve or chinois to remove any large chunks of almond. Add the almond mixture back to the blender along with the melon, lime juice, agave and salt. Process again until creamy. Check for seasonings and serve chilled. We enjoyed a visit from my sister and brother-in-law (thanks for the big bag of Anaheim chiles! 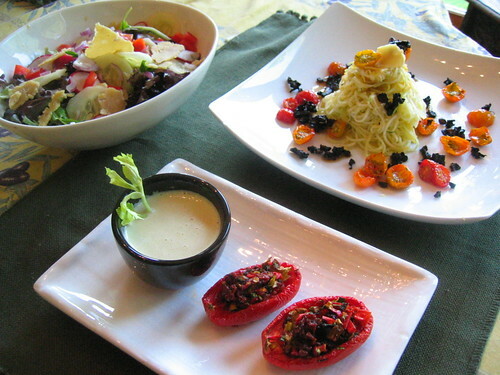 ), prompting the postponement of Raw Food Wednesday until Thursday. So tonight we went with the familiar apps of Tempura (broccoli and cremini mushrooms) served with a ponzu sauce and Tofu Triangles (marinated in a mix of tamari, gin, pepper and cornstarch) served with a chile sauce (rice vinegar, agave, rooster sauce, tamari). For dinner we went with a combo dinner of the traditional stir-fry (refried rice, tofu, shiitake mushrooms, carrots, red bell peppers, garlic, ginger, tamari) and the always spicy Green Curry Tofu (coconut milk, green curry paste, tamari) with Deep-Fried Rice Balls (using fresh rice). 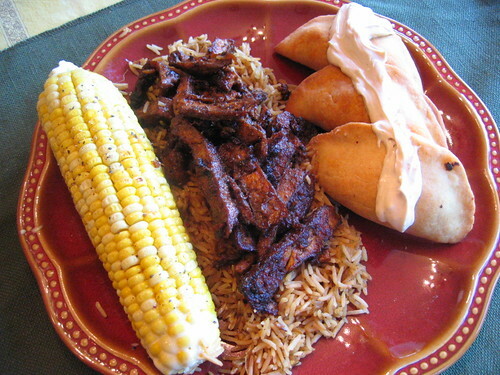 As we've mentioned before, this is one of our son's favorite dishes, but this really isn't the season for it -- until today, when it was downright... pleasant (mid 70's). The twice-fried tofu pairs well here with the white beans (cannellini), adding a nice textural crunch to the creamy beans, as well as a hearty smoked flavor to the entire dish. In a saute pan over medium heat, add 1 tbs. olive oil and the sliced onion. cook until translucent and just starting to show some color, 4-6 minutes. Add the garlic and herbes de provence and cook for an additional 1-2 minutes. Remove from pan and place on a plate. Add 1 tbs. of olive oil and add the soyrizo (or tvp) and saute, scraping the pan occasionally until starting to show signs of carmelization, 4-6 minutes. Add the onion and garlic back to the pan along with the cannellini beans (and their liquid), tomato sauce and smoked paprika (to taste). Stir to combine, bring to a boil, cover and simmer for about 20 minutes, stirring occasionally so it won't stick to the bottom as it will get quite thick near the end of cooking. Check for seasoning as the beans will probably need some salt at this point. Add the twice-fried tofu and serve over pasta. 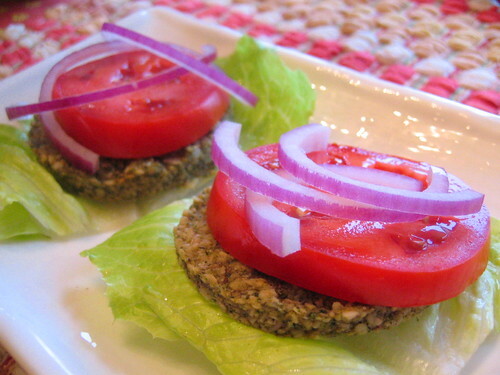 Cut the tofu into eight individual cutlets. If you're smoking the tofu, add the hickory chips to your smoker box and process for 20-30 minutes. Remove the tofu from smoker box. 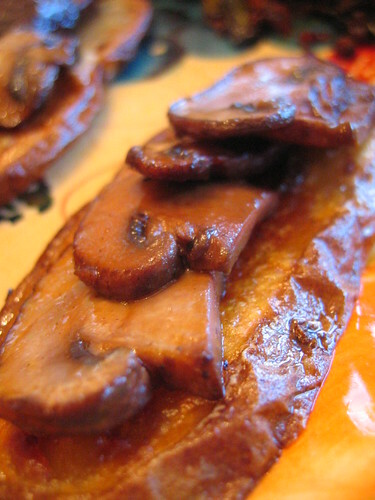 Over med-high heat add the canola oil and pan-fry until golden brown on both sides (about 8 minutes). Remove from pan and let cool for at least 10 minutes. Or, you can refrigerate the tofu at this point, up to a day in advance. Slice the tofu diagonally into strips about a 1/4" thick. Add about 1 tsp. 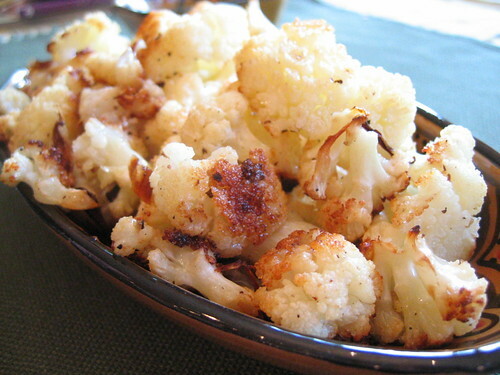 of canola oil to the pan, and return to med-high heat, turning occasionally for 3-5 minutes. 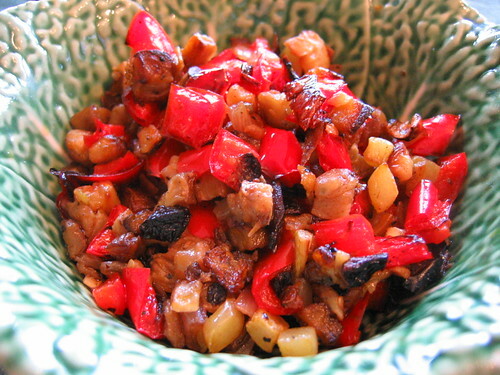 Lower the heat to low, add tamari to taste (about 1 tbs.) and continue to cook for an addition 1-2 minutes until the tofu begins to get crispy. If you don't have a smoker, you can add 1 tsp. 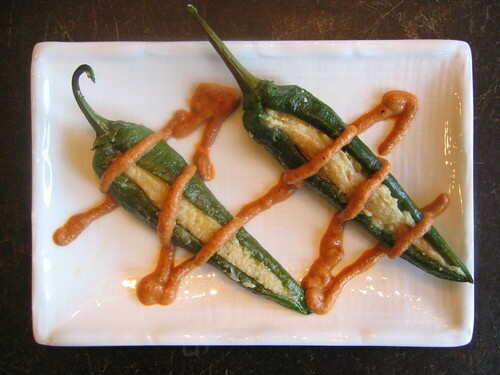 of smoked paprika right after the tamari. 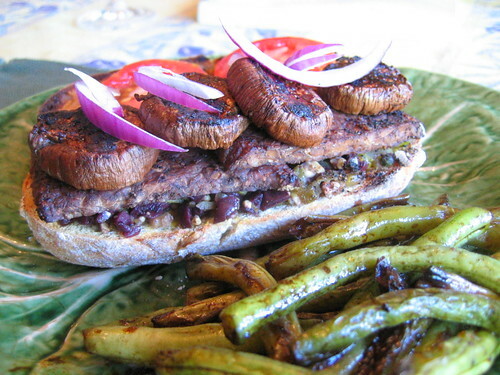 The muffaletta sandwiches are from "Artful Vegan" -- First you marinate the tempeh and eggplant for an hour, then it's smoked (with hickory) for 20 minutes, then baked with the marinade (clove, cinnamon, allspice, pepper, salt, garlic, tamari, balsamic vinegar, agave, veg stock). The relish is roughly an equal mix of minced kalamata olives, pickled okra and some of our homemade pickles (in place of the cucumbers called for in the recipe). 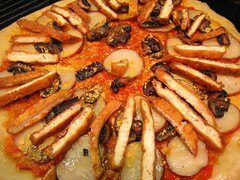 The bread is place under a broiler after being brushed with an equal mixture of olive oil and nutritional yeast. Then you add the relish on the bottom, then the tempeh and eggplant, and top with dijon mustard and place back under the broiler for another two minutes. Add sliced tomato and red onion and close the sandwich (gently). We decided to make the satay because seitan cooks at a different rate than the veggies, so it was easier to just make separate skewers and a quick sauce of coconut milk, peanut butter, cherry bomb peppers and tamari. We broke out the smoker box last night and gave both the tofu and yukon gold potatoes a shot of apple wood -- really nice. Note 1: We make this in a 6qt. mixer -- if you have a smaller mixer, split the ingredients in half and make two separate batches. 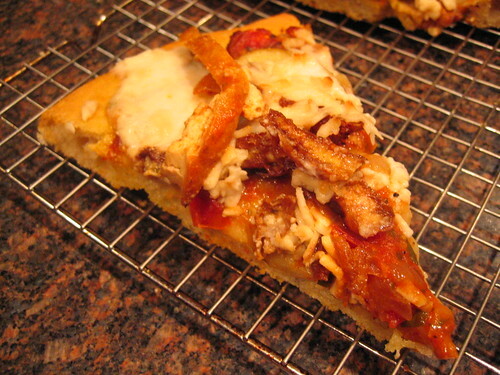 Note 2: This recipe calls for a pizza stone, pizza pan and pizza peel. If you don't have a pizza stone, just leave it in the pizza pan. If you don't have a pizza pan, you can just shape it into round with a well-floured rolling pin, and cook it on a heavy flat-edge cookie sheet. On low speed, mix the flour, yeast and sugar with the dough hook. Slowly add 2 tbs. olive oil and 3 cups of water and until the dough gets soft and smooth -- approximately four minutes. You may not need the the last cup of water depending on the humidity and dough type (we use King Arthur organic bread flour). Add salt, and mix for one additional minute. Alternatively, if you can -- cover and place in the fridge overnight, or at least six to eight hours. We've found the slow rise really helps the taste and texture. Punch the dough down, and let rise again until doubled (1-3 hours). Divide dough in half -- oil two 14" pizza pans with the olive oil and sprinkle well with corn meal (or you could just bake them one at a time). Flour your hands and flatten dough as well as possible (it'll fight you), cover lightly with oiled plastic wrap (so it won't stick) and let rest 20 minutes. Or roll with a well floured rolling pin and cover well with a clean kitchen towel (we have a few towels that we use just for baking). Form again, flatten as well as possible, to about a 1/2" thick. Drizzle olive oil on the surface of the shell. Dimple with you fingertips to within an inch of the edge. This keeps it from bubbling up in the middle when you par-bake. In a pre-heated 450F oven, place pizza pan directly on pizza stone for approximately 10 minutes until faint brown spots appear. Remove from oven and let cool slightly. 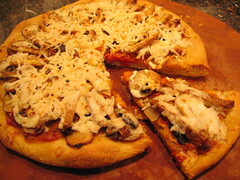 Remove shell from pan with a spatula and place onto a pizza peel lightly coated with corn meal. 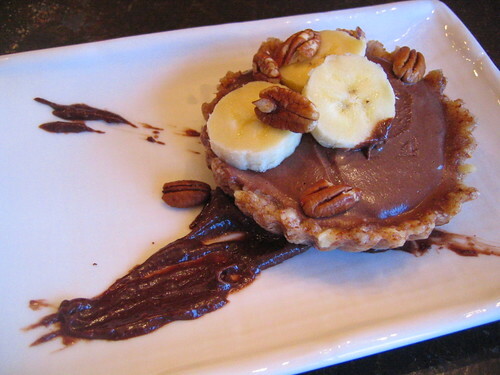 Add toppings (don't overload) and leave about an 3/4" between the toppings and the edge of the shell. Brush exposed edges with additional olive oil and place back in the oven for another 10-15 minutes (rotating once) until the toppings have cooked and/or FYH has melted. Add the olive oil to the pressure cooker over med-high heat. Peel and cut the onion in half. Stud two cloves into one half of the onion and saute in the pressure cooker until the onion starts to show some color (about 3-5 minutes). Add 1 cup of rinsed and sorted lentils to the pressure cooker along with the veg stock -- it should cover the lentils by an 1/2" or so. Add the lid, and cook for 16-18 minutes on the first ring (on the Kuhn-Rikon brand) or the equivalent of 7 psi. After cooling, season the lentils with salt, pepper and herbes de provence. If they're a little soupy, that's all right. In a large saute pan or wok, saute the other half of the onion, sliced thinly for 4-5 minutes until translucent. Add the garlic, sun-dried tomatoes, salt and pepper and cook for 1 more minute. Remove from pan and set aside. Add 1 tbs. of olive oil to the saute pan or wok on med-high heat and cook the seitan until well browned on all sides, about 7-9 minutes. Add the lentils and onion mixture to the seitan. Add one cup of red wine and stir to incorporate. Bring to a boil, add the lid and simmer for an additional 10 minutes. Check for seasoning and serve over pasta or rice. The roma tomatoes used for the caponata were a little smaller than last time, so there was a bit of filling leftover (a.k.a. lunch tomorrow, bonus! ), but the advantage was that you could just pop them into your mouth in one bite. Perfect for your next raw dinner party. 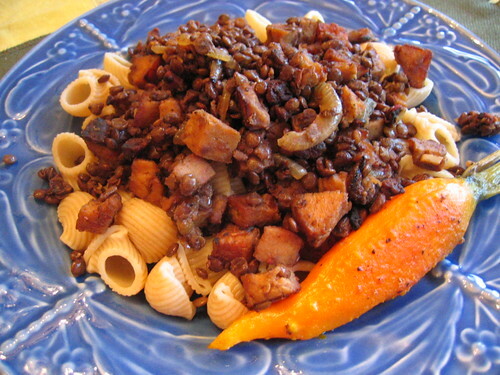 The pasta, used both a zucchini and yellow squash (watch out for the seeds!). The tomatoes get incredibly sweet in the dehydrator, which are balanced by the earthy mushrooms (marinated in olive oil, nama shoyu and pepper). 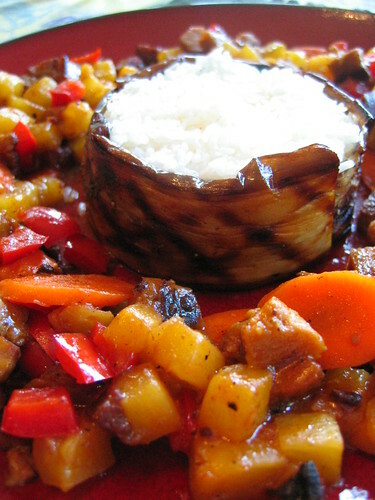 Fun with plating tonight -- we took two grilled Japanese eggplant slices and wrapped them on the inside of a ring mold, then added the rice which pressed the eggplant against the mold, sealing the two pieces together. 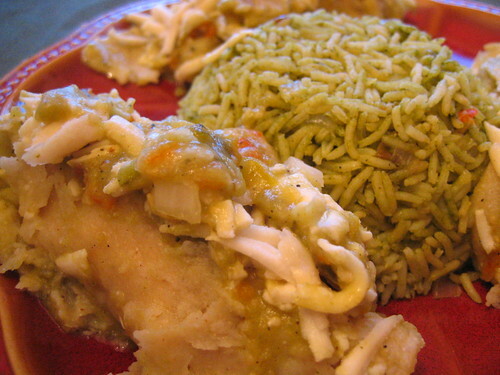 The arroz verde is one of our favorite ways to serve rice -- a pilaf style dish, full of flavor that makes a good accompaniment for the enchiladas. 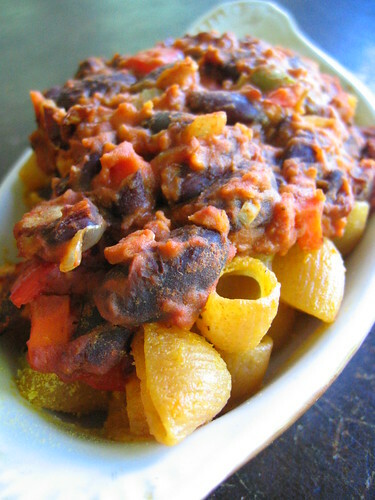 Adapted from Rick Bayless. Cut the poblano into large chunks and add to the water. Bring it to a boil, then slightly cover with the lid and simmer for 10 minutes. Puree the poblano and water along with the cilantro and 1 tsp. salt. In a large pan, add 1 tbs. of olive oil on medium heat. Add one medium onion, chopped small. Saute for 5 minutes until onion gets translucent. Add 2 tsp. garlic, minced, 2 tsp. Mexican oregano, salt and smoked pepper to taste and cook for one additional minute. 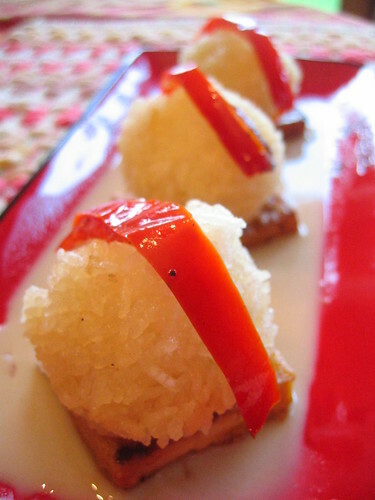 Add 1 cup basmati rice and stir until it gets well coated with the oil, about 2-3 minutes. Add the poblano mixture, stir to combine, scrape down the edges. Bring to a boil, reduce heat to low, put the lid on and don't peak for 15 minutes. Remove lid, fluff the rice with a fork, put the lid back on and wait 5 minutes. Check for seasoning, and serve hot. Basement Update Day 3: Good news, there is a floor underneath all of the boxes/containers/plastic bags. The bad news, there are more boxes/containers/plastic bags to move to the empty spaces. Sisyphus had it easy. 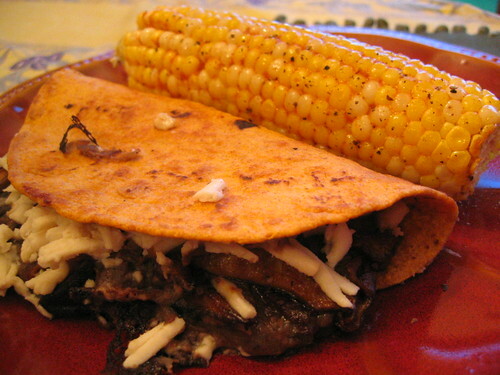 The (dang) quesadilla is shiitake mushrooms, FYH Monterey Jack, refried black and pinto beans with onion, garlic, smoked paprika and pepper on a red pepper tortilla. 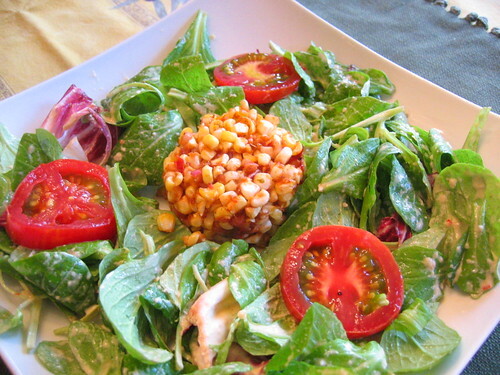 The corn was local and organic, from Saturday's Farmer's Market in Kent. Prepping the corn involves trimming off the top 1/2" or so, then most of the stem and removing all but two or three layers of husk. Then, just let them soak in water for 10 minutes, finally grilling them about 10-15 minutes, turning every couple of minutes to get a nice even char. After removing the husk/silk we brush on the chipotle, lime and soy margarine mixture, salt and smoked pepper. The saga continues -- a.k.a. The Basement Ordeal Day 2: Trapped Underground. Between the kids toys, the old gaming consoles (anyone up for a game of "Sonar Search" on the Fairchild Channel F? ), cases of wine and all of my old PA gear, monitors, cabinets, mixers, cymbals stands, amps and guitars, it's amazing how much cruft builds up in 11 years. 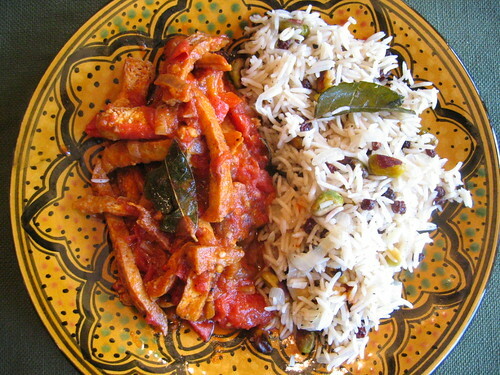 We scored some fresh curry leaves at the West Side Market Wednesday, so we made two of our favorite Indian dishes. 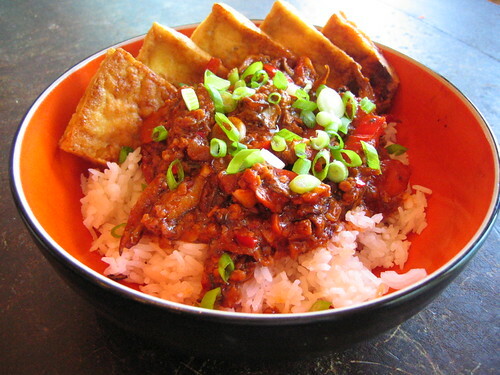 The spiced tomato sauce and twice-fried tofu (fried as cutlets, cooled, shredded and stir-fried with a little tamari) matches very well with the fragrant rice. 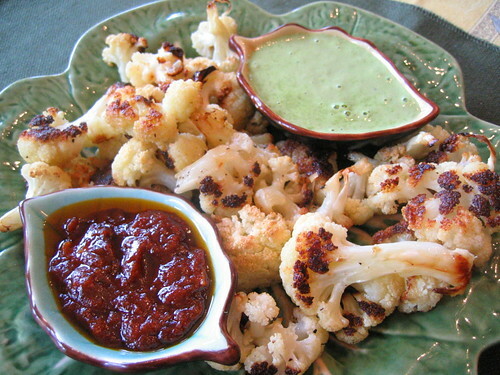 The roasted cauliflower was also from the West Side Market (and cheap -- $1 for two organic heads), and the barbecue sauce (hiding in the upper left corner) is basically ketchup with garlic, ginger, tamari, cumin and sugar -- but works surprisingly well with the roasted cauliflower. It was a hot one today -- 93F in the shade. We drove up to the West Side Market in Cleveland and picked up the some goodies -- poblano chiles, okra, mushrooms, Japanese and the little Italian eggplants. By the time we came home we were tired and in need of something cooling. Grind the almonds/carob/cardamom in the Vita-Mix. Remove 2 tbs. to use for final dusting. Stick in the fridge for a few hours -- overnight is much better. 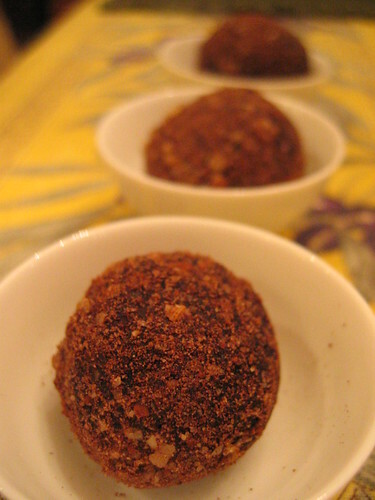 Wet your hands, roll into balls, then roll in the almond/carob/cardamom mixture.